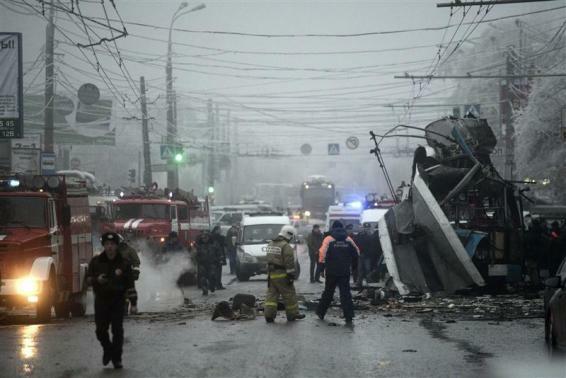 Russia President Putin vows to annihilate "Terrorists"
Members of the emergency services work at the site of a bomb blast on a trolleybus in Volgograd December 30, 2013. President Vladimir Putin on Tuesday vowed to annihilate all “terrorists” following two deadly bomb attacks in the southern Russian city of Volgograd that raised security fears ahead of the Winter Olympics. The uncompromising remarks in a televised New Year address were Putin’s first public comments since suicide bombers killed at least 34 people in attacks less than 24 hours apart on a railway station and a trolleybus on Sunday and Monday. But after two decades of violence in the North Caucasus, Islamist militants continue to pose a threat beyond their home region. Russia’s Olympic Committee chief said no more could be done to safeguard the Games since every measure possible was already in place around Sochi, beneath the Caucasus mountains. The bombings just ahead of Russia’s biggest annual holiday followed another suicide bus blast in Volgograd in October and came little more than a month before the start of Games on whose success Putin has staked his personal reputation. “We will confidently, fiercely and consistently continue the fight against terrorists until their complete annihilation,” he said in remarks from the far eastern city of Khabarovsk, where he met victims of severe floods. Acknowledging “problems and serious tests” in 2013, including the Volgograd bombings, he vowed to ensure the security in the year ahead, when Russia stages the Winter Olympics from February 7-23. Putin, who came to power when Boris Yeltsin announced his resignation on New Year’s Eve 14 years ago, won popularity early in his presidency by crushing efforts to forge an independent state in Chechnya but he has been unable to stop Chechen and other Islamist militants across the North Caucasus. Police detained dozens of people in sweeps through Volgograd on Tuesday but there was no indication any were linked to the attacks, for which no one claimed responsibility. Mourners laid flowers at the site of the bombing that tore the bus apart and left residents fearing further violence. “I’m frightened,” said Tatyana Volchanskaya, a student in Volgograd, 700 km (400 miles) northeast of Sochi. She said some friends were afraid to go to shops and other crowded places. Putin ordered tighter security nationwide after the blasts, but Russian Olympic chief Alexander Zhukov said no additional measures would be taken at Sochi: “As for the Olympic Games, all necessary security measures have been foreseen,” Interfax news agency quoted him as saying on Monday. Insurgent leader Doku Umarov has urged militants to use “maximum force” to prevent the Games from going ahead. Russia drove separatists from power in Chechnya in a war that boosted the popularity of Putin, a former KGB officer. But the insurgency that spread across the North Caucasus region in the aftermath of that conflict has persisted despite Putin’s repeated, strongly worded pledges to eliminate the militants whose attacks have cast a shadow over his rule. As prime minister in 1999, he vowed to “wipe them out in the shithouse” and in 2010, after female suicide bombers killed 40 people on the Moscow metro, he ordered police to find their masters and “scrape them from the bottom of the sewers”. Less than a year later, in January 2011, a bomber from the North Caucasus killed 37 people at a busy Moscow airport. The rail station bombing in Volgograd was the deadliest attack outside the North Caucasus since then, killing 18 people. Citing unnamed sources, Interfax said the suspected attacker was an ethnic Russian convert to Islam who moved to Dagestan where he joined militants early in 2012. Investigators said they believed a male suicide bomber was also responsible for Monday’s morning rush-hour blast. Volgograd – formerly Stalingrad – is a city of a million and a transport hub for an area of southern Russia that includes the North Caucasus. A car bomb killed a prosecutor’s assistant in Dagestan on Tuesday and two people were killed in a bomb blast there late on Monday, authorities said. In Volgograd, more than 5,000 police and interior troops were mobilised in “Operation Anti-terror Whirlwind”, Interior Ministry spokesman Andrei Pilipchuk said. He said 87 people had been detained after they resisted police or could not produce proper ID or registration documents, and that some had weapons. State television showed helmeted officers pushing men up against a wall. But there was no sign any were linked to the bombings or suspected of planning further attacks. Itar-Tass news agency said police were focusing on migrant workers from the Caucasus and ex-Soviet states – groups that rights activists say face discrimination from police. The success or failure of the Olympics will form a big part of the legacy of Putin, 60. He secured the Games for Sochi in 2007, during his first stint as president, and has not ruled out seeking a new six-year term in 2018. Nigeria decides – Goodluck Jonathan not so lucky?